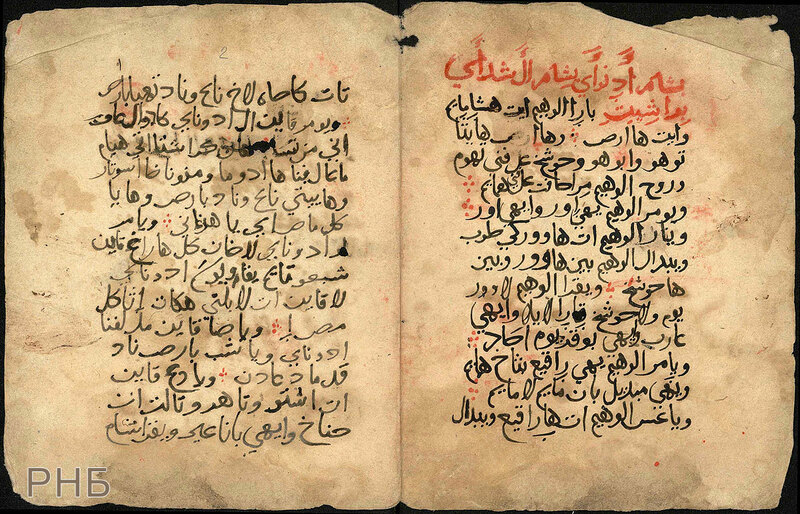 Book of selected poems by Karaite poets from 9th to 11th cent. 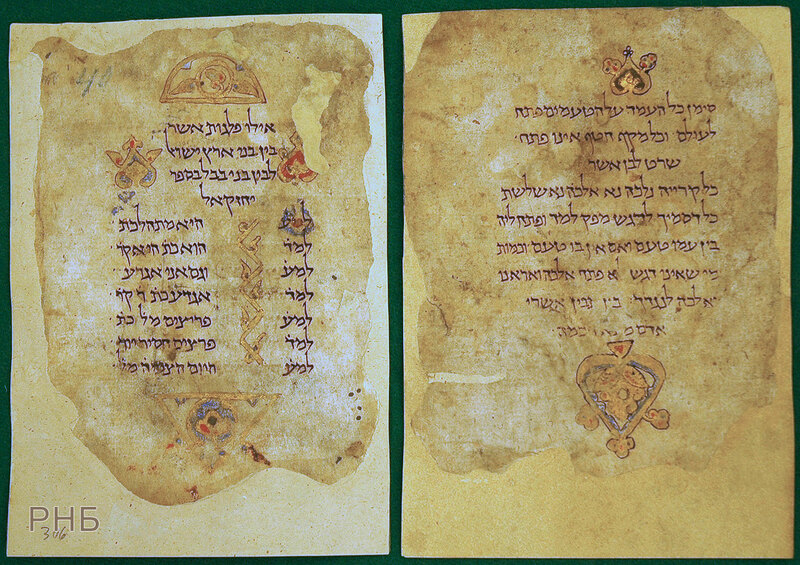 Gunzbourg D., Stassoff V. Ornamentation des anciens manuscrits hébreux de la Bibliothèque impériale publique de St-Petersbourg. SPb., 1886. In Hebrew. 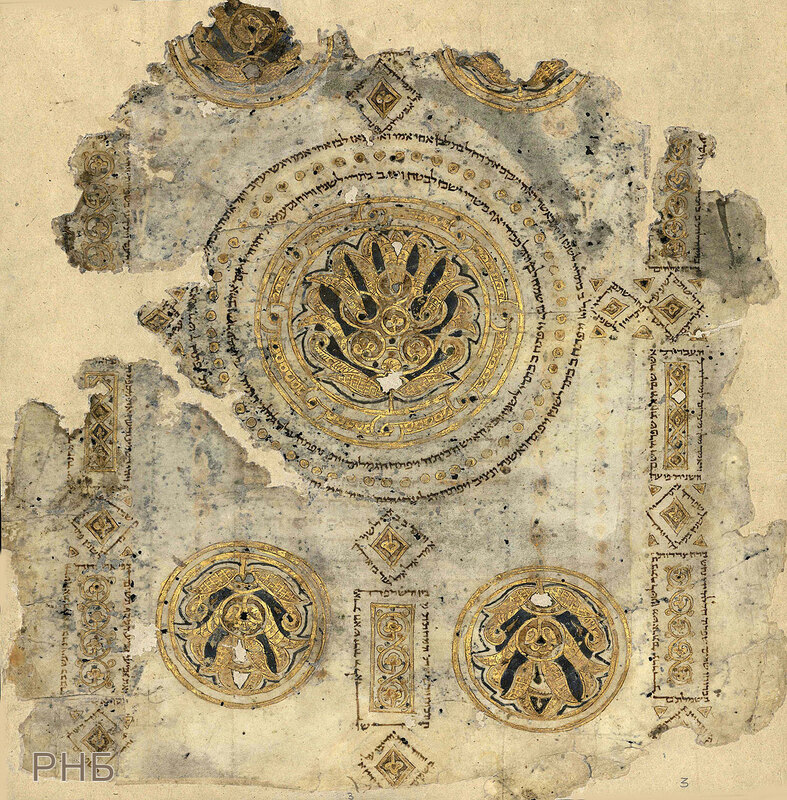 9th-10th cent. Leather. From the First Firkovich Collection. Acquired in 1863. In Hebrew. 916. 225 fols. Parchment. In Hebrew. 929. 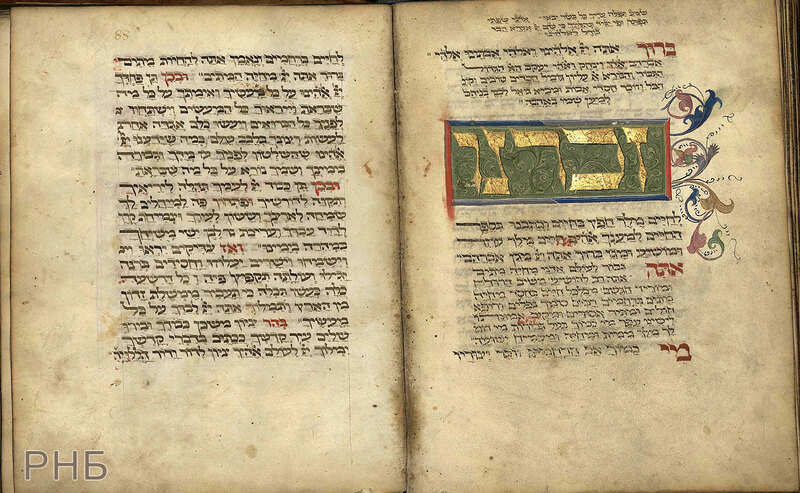 Scribe Shlomo ben Buya'a. Vokalizator and Masoret Ephraim ben Buya'a. Customers Avraham and Salih bnej Maimon. 491 fols. Parchment. From the Second Firkovich Collection. Acquired in 1876. Evr. II В 17, fol. 185v. 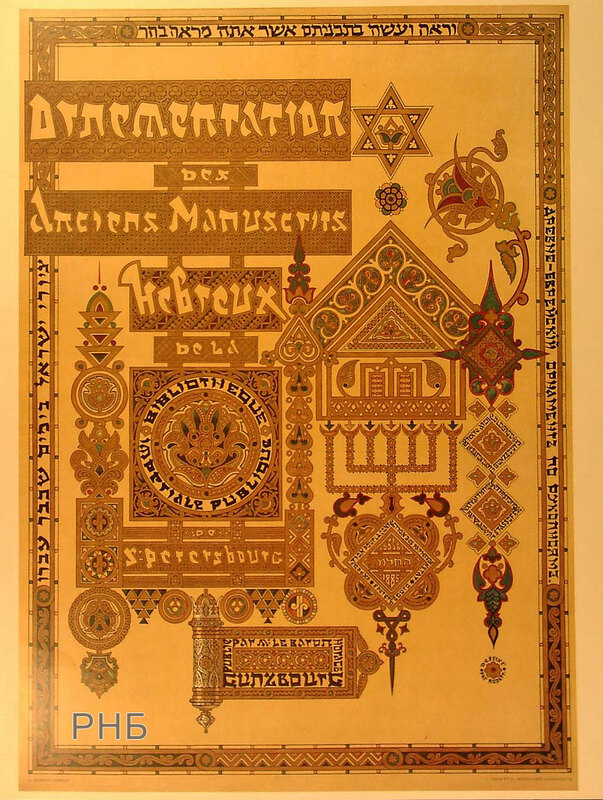 Illuminated frontispiece depicting the utensils used in the Tabernacle and later in the Temple in Jerusalem. From the Pentateuch of 929. Evr. II В 17, fol. IV. 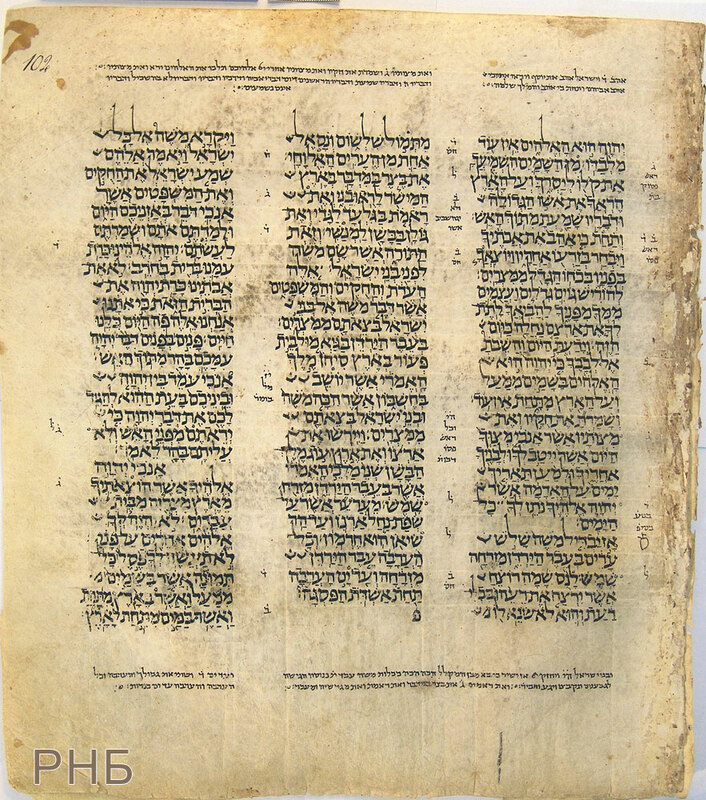 Bible (Tanakh). 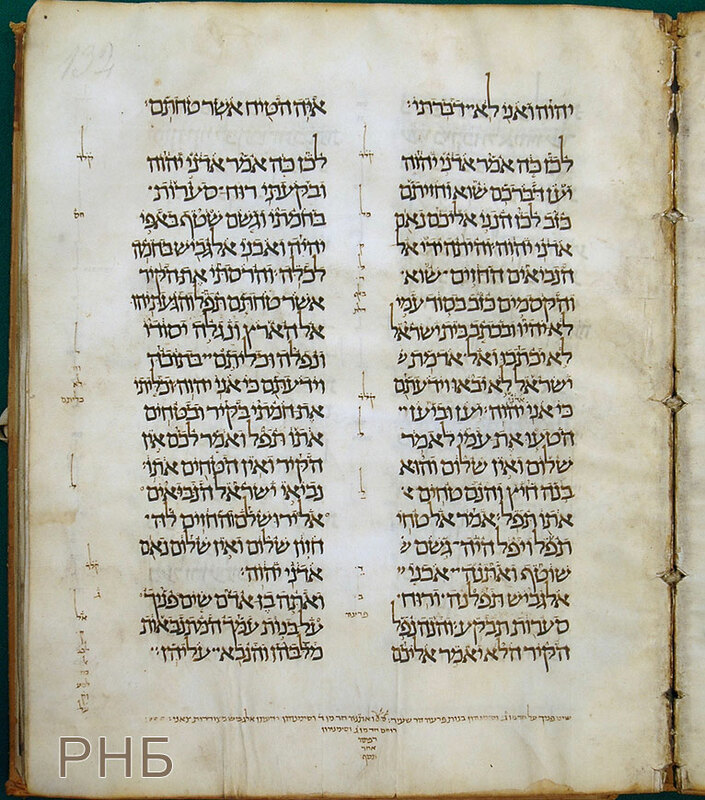 Leningrad Codex (the oldest complete dated manuscript of the Hebrew Bible). In Hebrew. 1008–1010, Cairo. Scribe Samuel ben Jacob. Customer Mevorah ben Joseph. 491 fols. Parchment. Evr. I В 19 A, fol. 102. 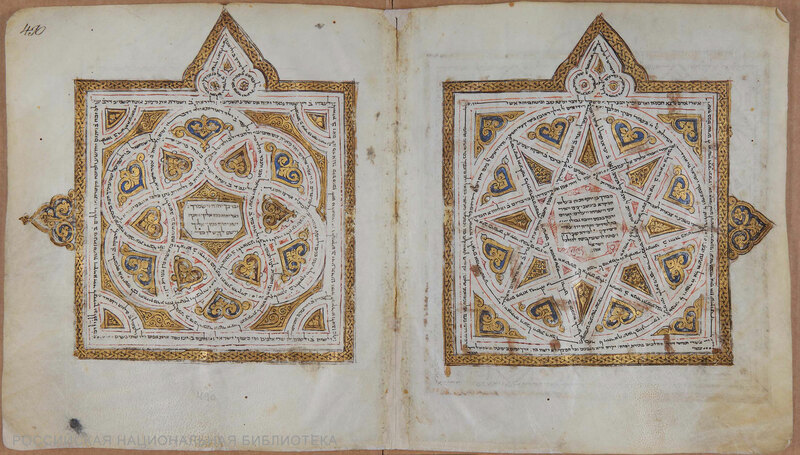 Illuminated pages from the Bible of 1008–1010. 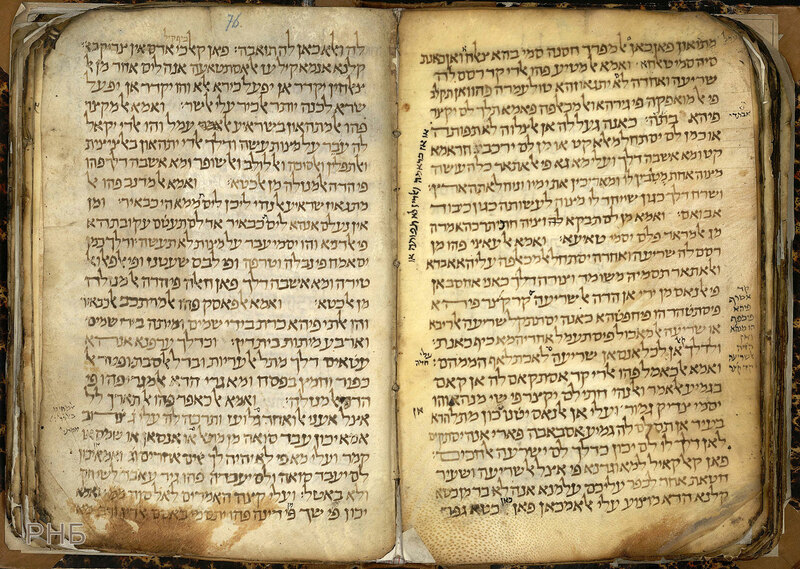 Final Masora (Masoretic notes). 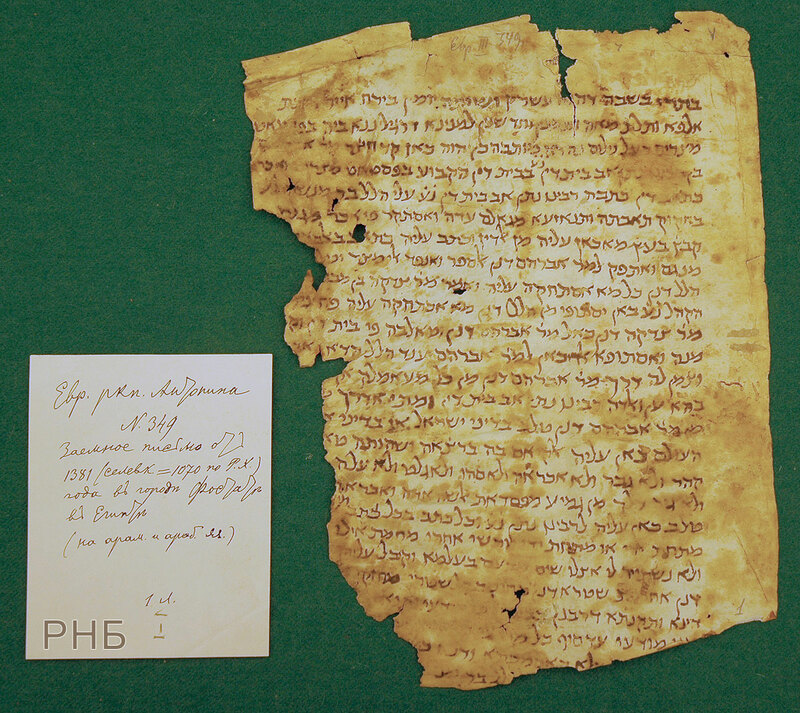 Fragment of the Bible. In Hebrew. 1087–1089. (?) Scribe Isaac ben Samuel. 1 fols. Parchment. From the First Firkovich Collection. Acquired in 1862. Evr. I Bibl. 111, fols. 1v. In Hebrew. 11 cent. Customer Mevorah ben Tzedek ben Jonah ben Shelah. 6 fols. Parchment. Evr. 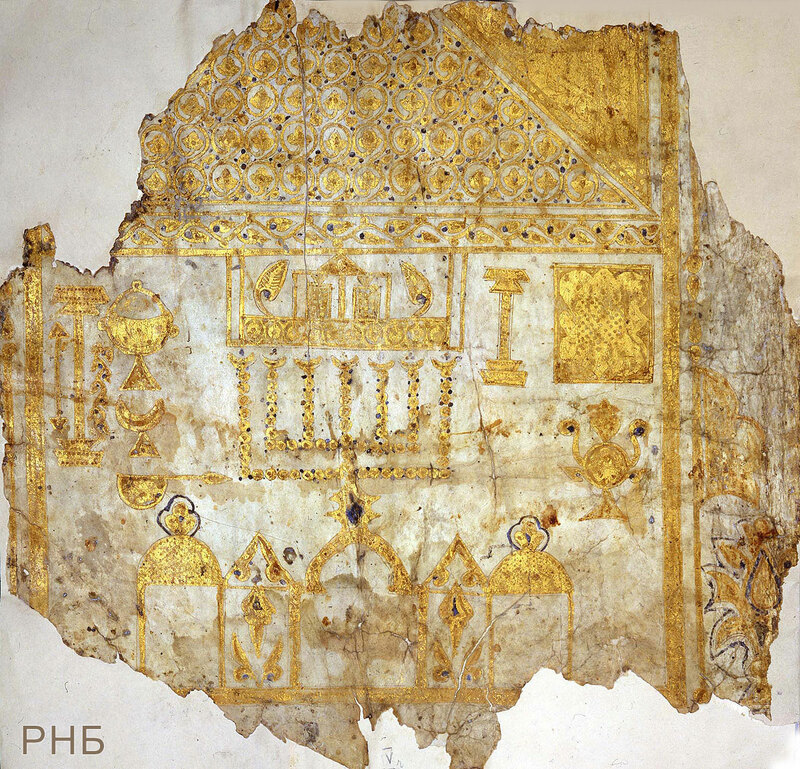 II В 262, fol. 3. 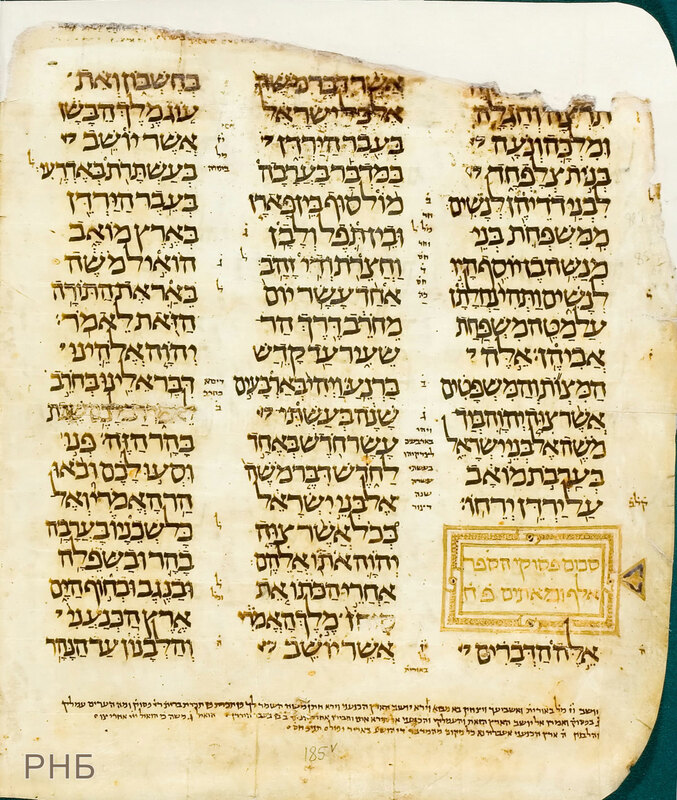 Final Masora (Masoretic notes). 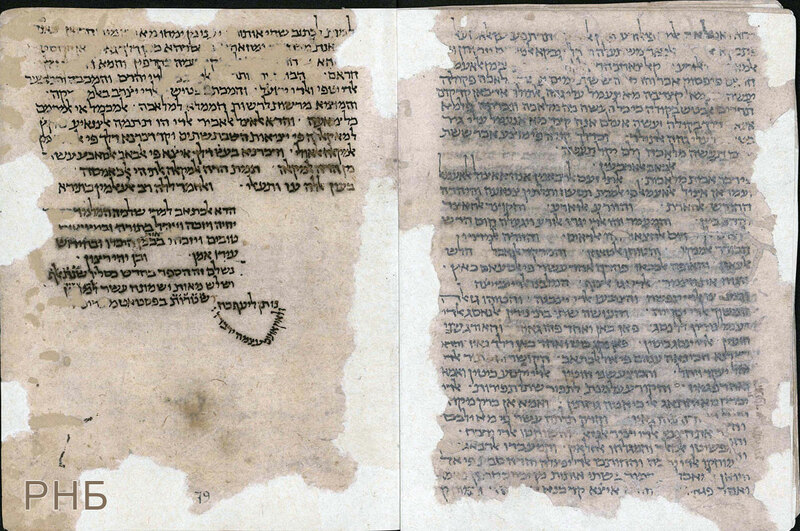 Fragment of the Pentateuch. 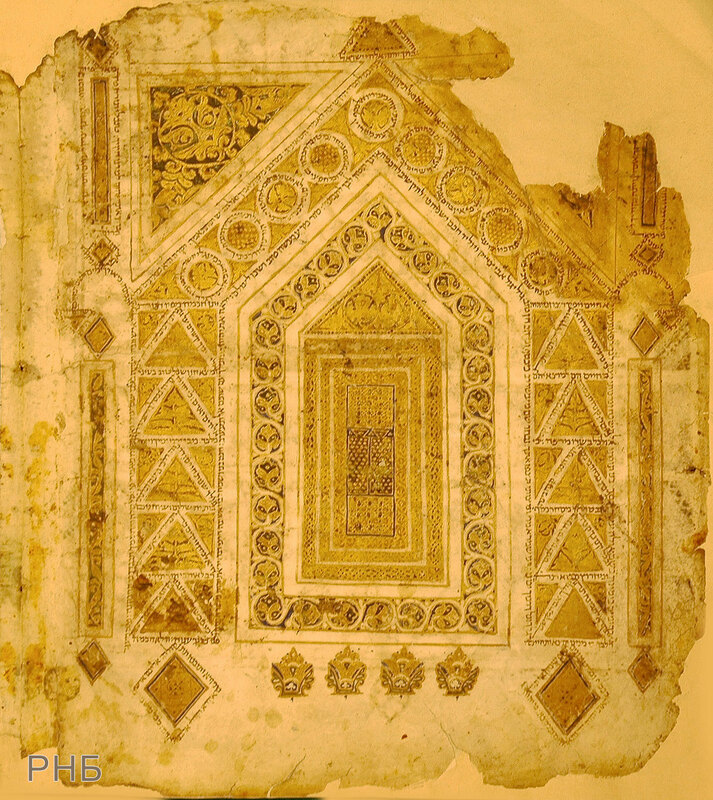 An illuminated sheet supposedly shows the Tabernacle of Moses; in another version - its plan. In Hebrew. 11 cent. 12 fols. Parchment. Evr. II В 49, fol. 2v. 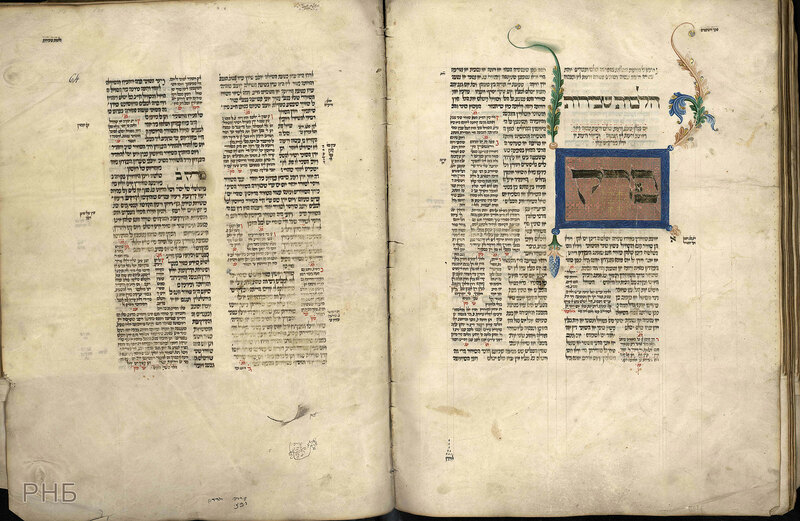 Pentateuch with the Arabic translation by Saadia Gaon. In Hebrew and Arabic. Early 11th cent. Egypt. 529 fols. Paper. 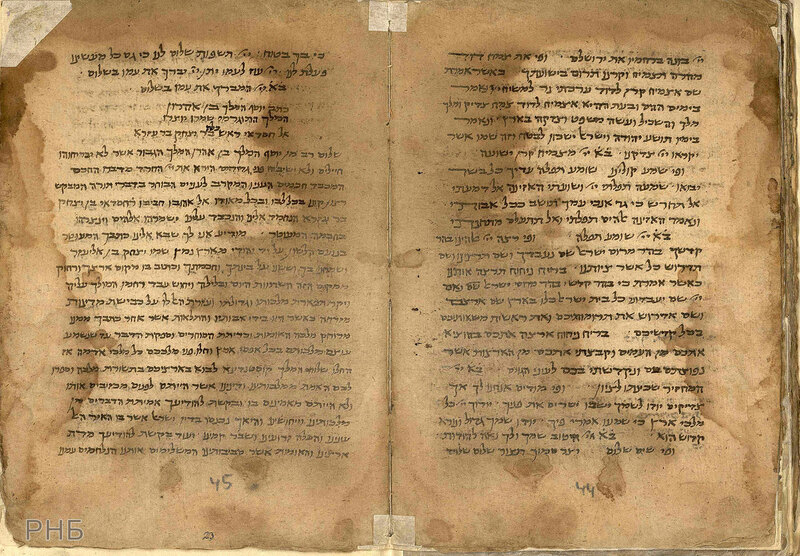 Scribe Samuel ben Jacob. Customer Solomon ben Abraham. Evr. II С 1/1, fols. 1 and 2. In Hebrew. 1122. Alexandria (Egypt). 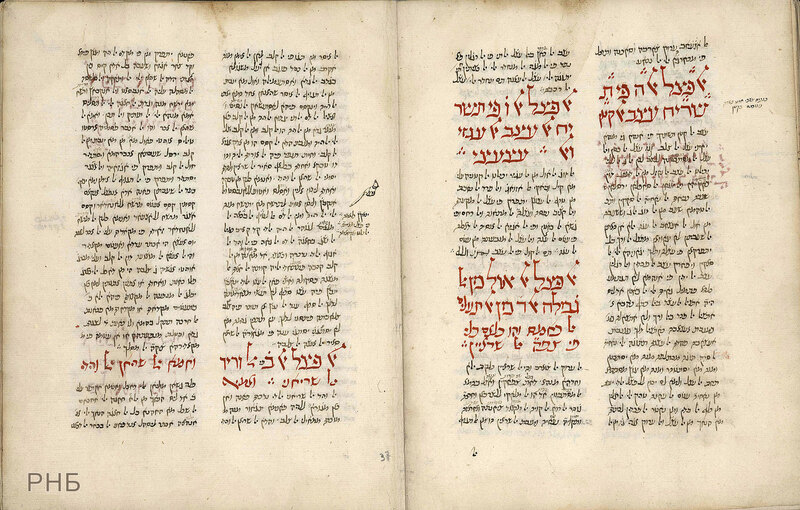 Scribe and vokalizator the Masoret Joseph ben Jakov ha-Sofer. 315 fols. Paper. Evr. II C 144, fols. 306 and 291v. In Hebrew. 13th–14th cent. North Africa and Spain. 98 fols. Parchment. Evr. II В 101, fols. 95v. and 98. Last Prophets. 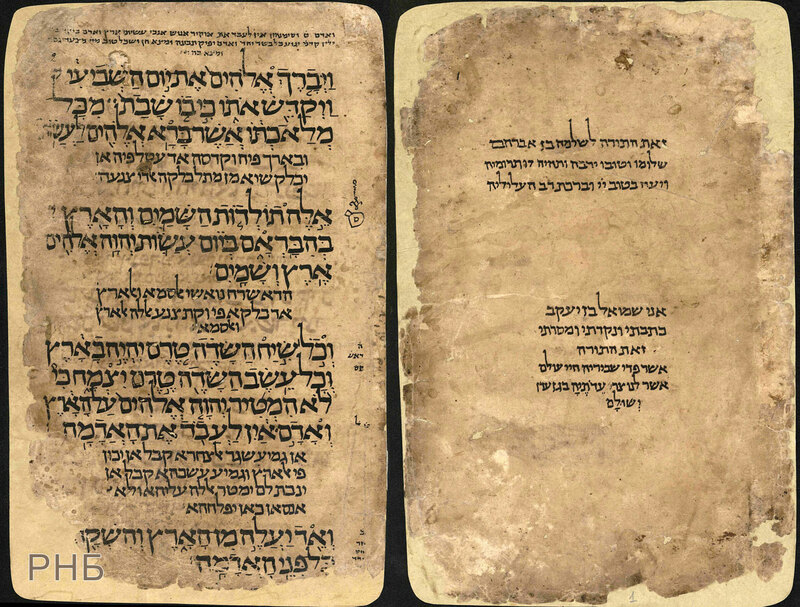 Final Masora (Masoretic notes). In Hebrew. About 1260. Spain (Toledo?). 232 fols. Parchment. Evr. II В 53, fols. IIIv. –IV. 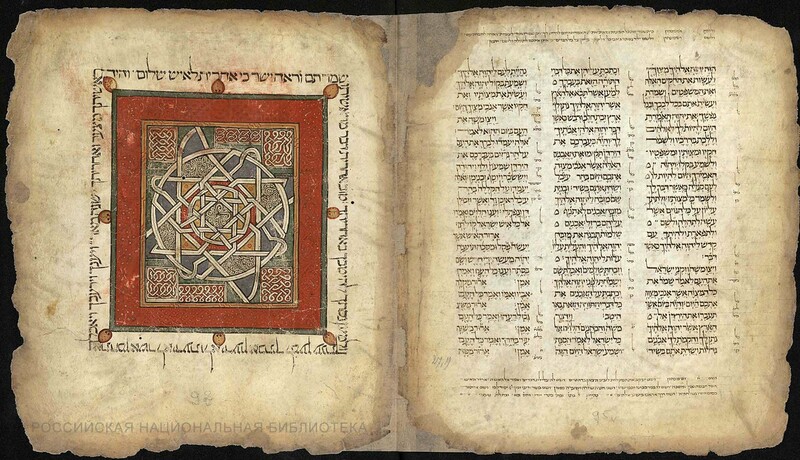 Hebrew text written in Arabic characters. 1430. Egypt (?) Paper. In Hebrew and Aramaic. 14th cent. France or Germany. 200 fols. Parchment. Evr. I В 2, 230v.–231. Moses Maimonides. 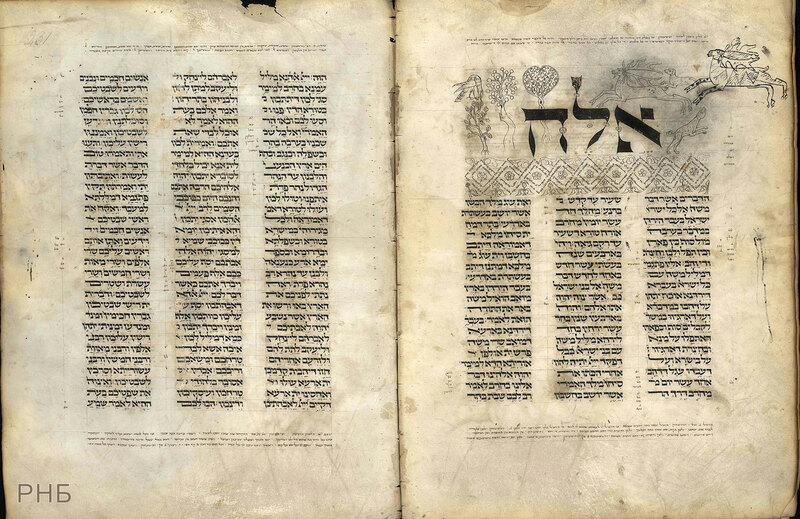 Mishneh Torah ("Repetition of the Law"). In Hebrew. Late 14th cent. Italy. 95 fols. Parchment. Evr. n. s. 1, fols. 63v. –64. Ibn Sina (Avicenna). Canon of Medicine. 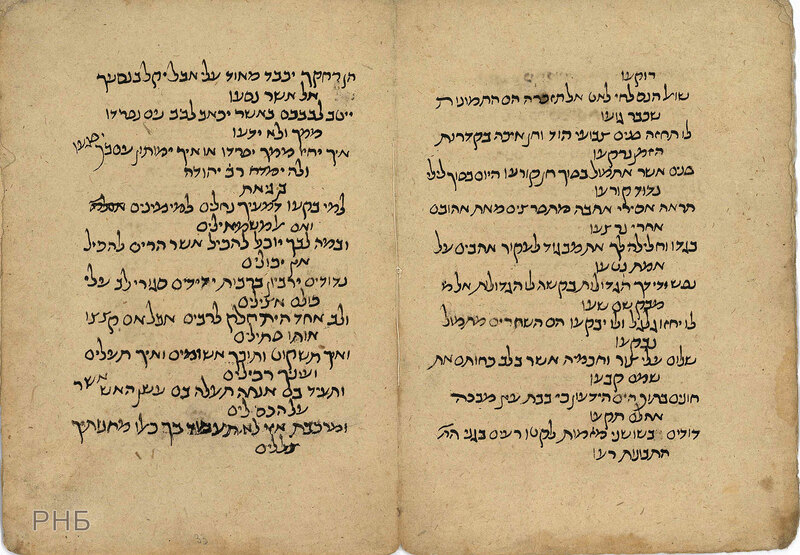 Arabic text written in Hebrew characters. 1420. South Italy. 173 fols. Paper. Evr.-arab. I 1311, fols. 36v.–37. Jacob Qirqisani. Book of Lights and Watchtowers. Fragment. Arabic text written in Hebrew characters. 1006. Egypt (?) 81 fols. Paper. Evr.-arab. I 4520, fols. 78v.–79. Saadia Gaon. Book of Beliefs and Opinions. 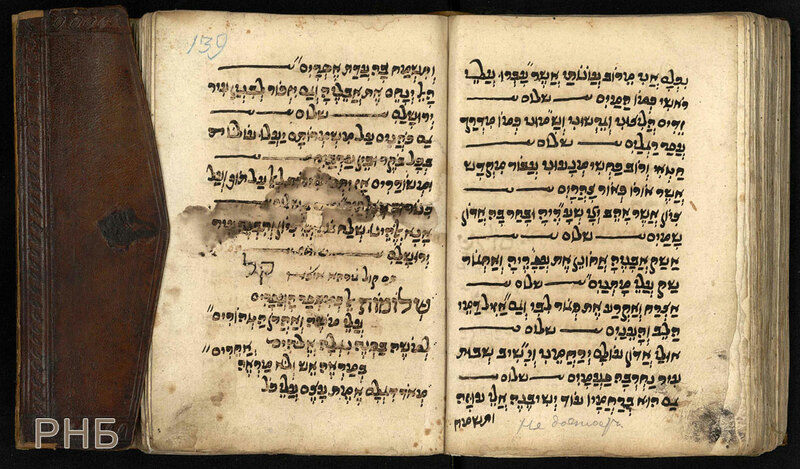 Arabic text written in Hebrew characters. 12th cent. (?) 132 fols. Parchment. Evr.-arab. I 127, fols. 75v.–76. 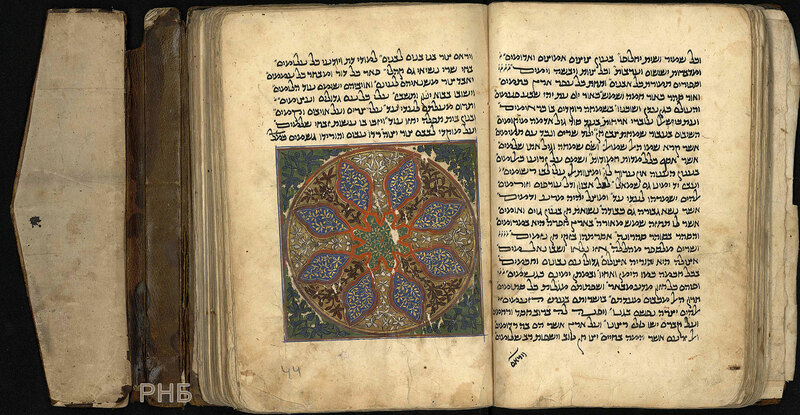 Book of Midrashim and a copy of the letter from the king of the Khazars Joseph to Hasdai ibn Shaprut, a Jewish dignitary in the court of the Caliph in Cordova. In Hebrew. 13 cent. Egypt (?). 26 fols. Paper. Evr. II A. 157/1, 22v.–24 (p. 44–45). 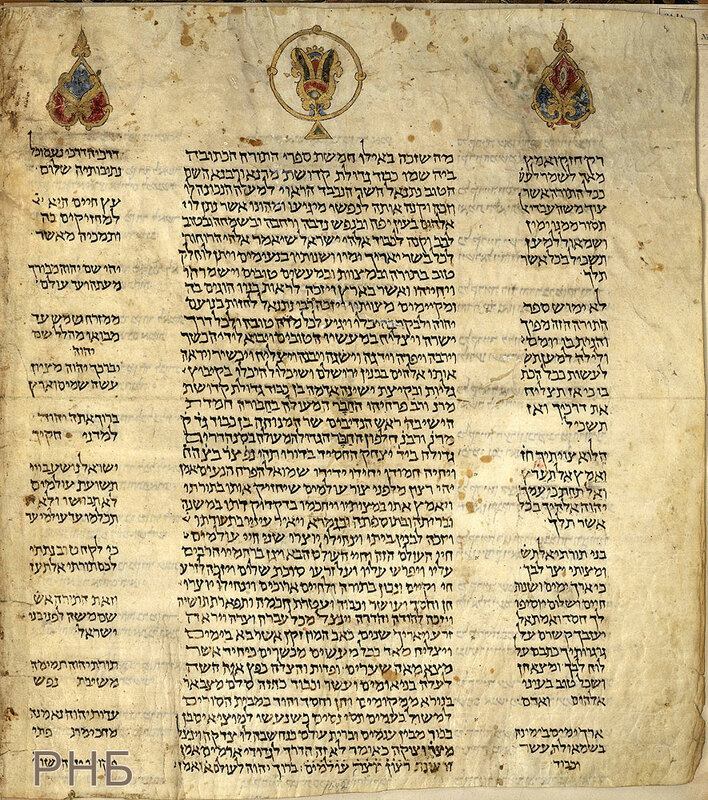 Judah Halevi. Diwan (a collection of poetry). In Hebrew. 12th-13th cent. Spain (?). 56 fols. Paper. Evr. II A 43, fols. 32v.–33. Moses ben Abraham Dari. Diwan (a collection of poetry). In Hebrew. 14th–15 cent. 138 fols. Paper. Evr. I 802, fols. 43v.–44. 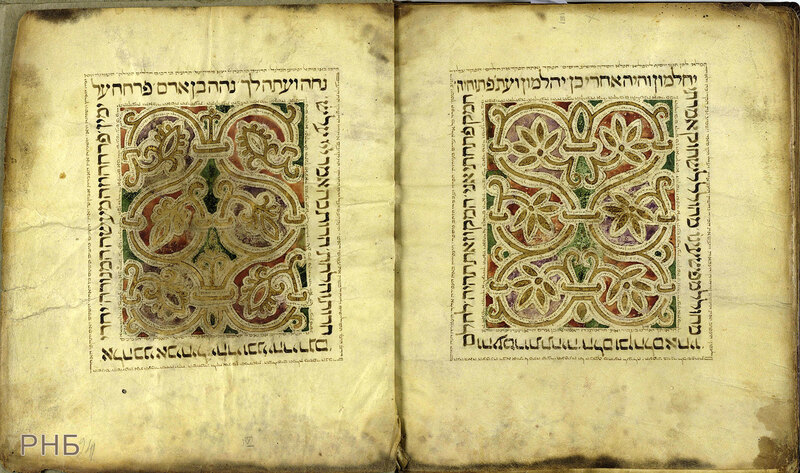 In Hebrew 18th cent. 278 fols. Paper. Evr. n. s. 53, fols. 138v. –139. 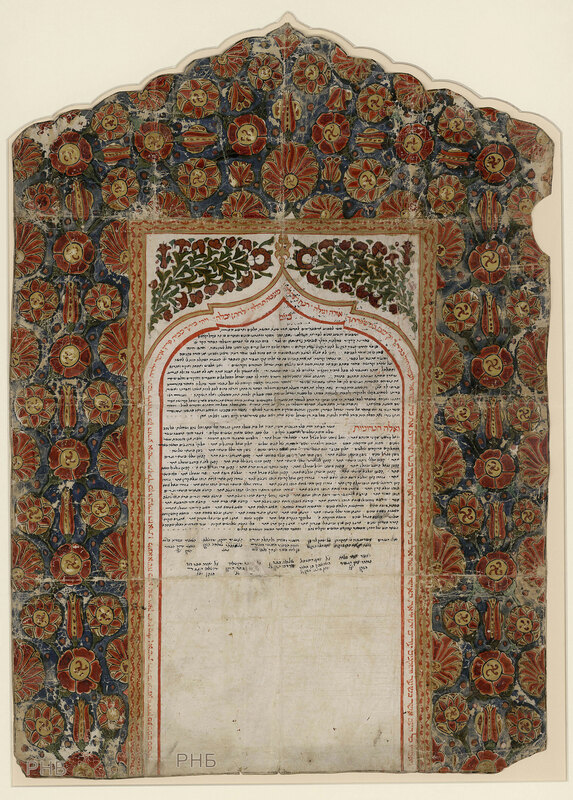 Marriage contract (ketubba) between Jacob ben Nathan and Durra bat Kisan. In Aramaic. 1065. Cairo. 1 fols. Parchment. From the collection of Archimandrite Antonin (Kapustin). Acquired in 1899. In Aramaic and Arabic. 1070. Cairo. 1 fols. Parchment. 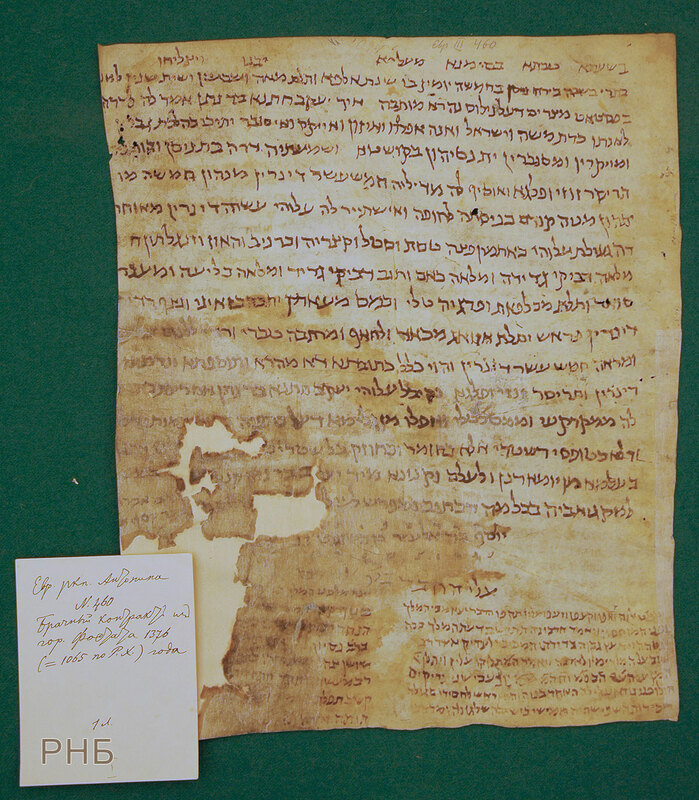 Marriage contract (ketubba) between Abraham ben Mordechai ha Gabira with Marat-Fumiya bat Elijah Fawqa ha Gabira. In Aramaic. 1719. Chufut-Kale, the Crimea. 1 fol. Paper. 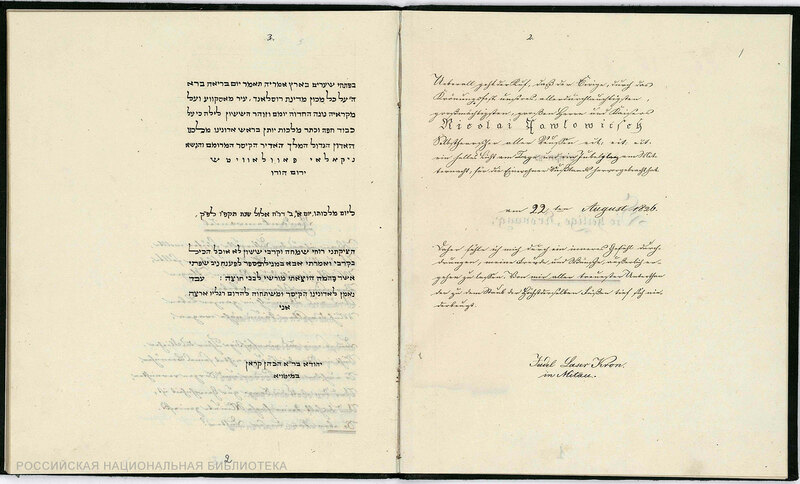 In Hebrew and German. 1826. 21 fols. Paper. Evr. n. s. 14, fols. 1v. –2. 34 сстава. 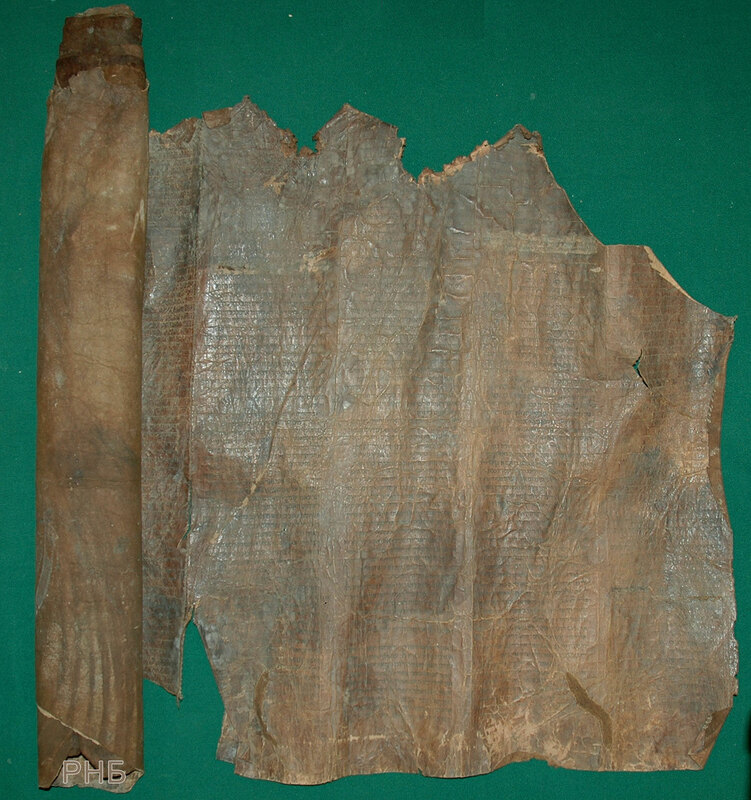 Parchment. 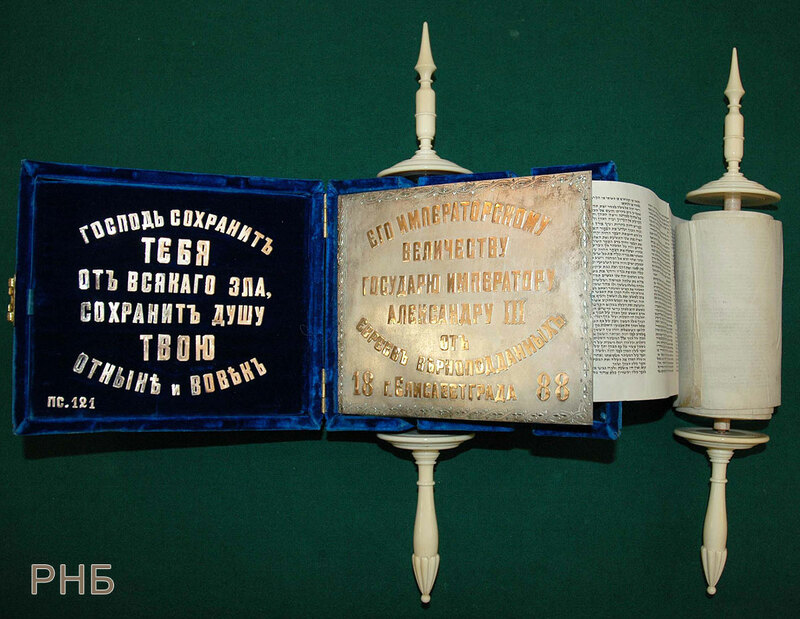 A blue velvet case, a silver board lid with the dedication to Alexander III in gold letters. From Alexander III. Acquired in 1888. Title page made by Ivan Ropet.